Preheat oven to 350 degrees. Cut squash in half, remove ends. Scoop out seeds, stringy portions. 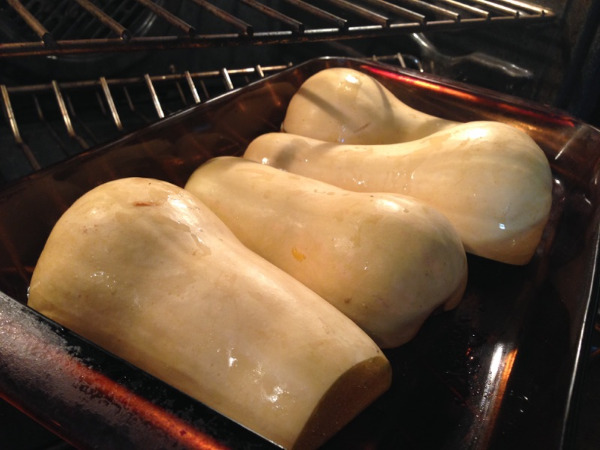 If using conventional oven, place squash in large glass baking dish, cut side down, bake until soft, 45-60 minutes; or microwave on high setting for 10-12 minutes until tender but not mushy. Cook apples by adding to squash in conventional oven 30 minutes before squash is done; or microwave separately on high for 5-8 minutes until tender but not mushy. Scoop squash from shells, chop apples into cubes. Place squash and apple in blender. Add cream, parsley, cinnamon and cloves. Purée to desired consistency. Lightly coat baking dish with cooking spray; spread purée in dish. Sprinkle almonds evenly over top. Bake 20 minutes until piping hot. *To toast almonds, spread on dry baking sheet and place in 400-degree oven for 5-7 minutes, until fragrant. Or place in dry skillet on stovetop over medium heat and stir constantly about 5 minutes until fragrant. You can also make this recipe into a soup. Instead of putting the puree in the oven, place it in a large saucepan over medium heat on the stove, add 4 cups reduced-sodium, fat-free chicken or vegetable broth, and heat through while stirring. Serve garnished with toasted almonds.